We supply towable air compressors and hoses for use with our grundomat piling hammers for installing Bottom Driven Piles and drilling rigs for installing Open Hole Drilled Mini Piles and Steel Cased Drilled Mini Piles. Mini Piling Plant Hire stock a wide range of towable compressors, air hoses, couplings, air tools and other accessories for delivery or collection nationwide. 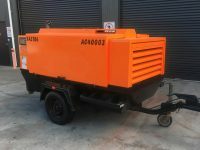 2 tool compressors are available as base machines, or with air hoses breakers and other accessories. Genair models are also available with built in generators for use with 110v or 240v tools such as angle grinders or electric breakers. 2 Tool compressors are used for powering grundomat piling hammers for installing Bottom Driven Piles. 400CFM and 600CFM compressors are available as base machines, or with air hoses and other acessories. 400CFM and 600CFM compressors are used for powering DTH hammers for installing Open Hole or Steel Cased Drilled Mini Piles. For use with Grundomat hammers when installing Bottom Driven piles. For use with DTH Hammers when installing Drilled Mini Piles. Bottom driven piles are used in poor ground conditions, or restricted sites, where deep foundations are impractical. Bottom Driven Piles are installed by driving a close ended steel pile tube to the ground with an internal drop hammer and drop weight piling rig, or grundomat pneumatic piling hammer and compressor. A thin walled close ended steel pile tube, or starter is driven first in lengths ranging from 1 to 3 metres. Once the first length has been driven, the process is continued by slotting an open ended steel pile tube, or follower into the back of the starter and joining it with a full fillet weld. Followers are driven into the ground by repeating the process until the required depth or predetermined set is reached. The drop hammer weight or grundomat hammer is then retracted and the pile tube is filled with concrete or grout.